I discovered arrowroot powder a few years ago when I began my real food journey. When I was avoiding grains in order to help improve my digestion I couldn’t use flour or cornstarch (corn is a grain) as a thickener. Arrowroot powder is an excellent thickener and, as I happily discovered, does not have a negative impact on my digestion. As I added grains back into my diet, I had concerns about how cornstarch was manufactured and about the use of GMO corn in cornstarch. 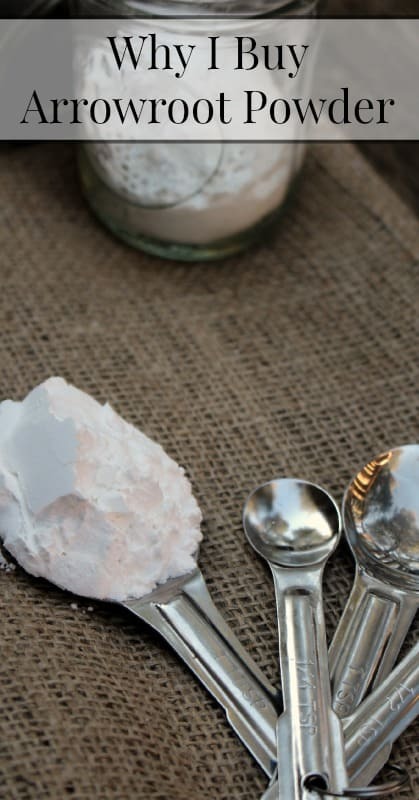 If you want to know more, Girl Meets Nourishment has an excellent post that compares arrowroot powder and cornstarch and talks more about how cornstarch is made. Arrowroot powder comes from the Maranta arundinacea plant. It is a starch. Arrowroot powder is commonly used in the Caribbean region and St. Vincent and Jamaica produce most of the world’s supply. Arrowroot powder is tasteless, has the consistency of cornstarch and dissolves easily at a lower temperature than cornstarch. It is best to dissolve arrowroot powder in a cold liquid instead of in hot liquids. While adding arrowroot powder to milk may result in a slimy finished product, I have never had any trouble when using arrowroot powder in my milk-based vanilla and chocolate pudding recipes. When subbing arrowroot powder for cornstarch use 2 teaspoons of arrowroot powder for every 1 tablespoon of cornstarch. When subbing arrowroot powder for wheat flour use 1 teaspoon of arrowroot powder for 1 tablespoon of wheat flour. Arrowroot powder is also known as arrowroot flour, arrowroot starch or just plain arrowroot. Here is my favorite arrowroot powder.